Pack of 200 3″ X 2.5″ index cards. Multi, ruled front, and blank back. Pack of 200 3″ X 2.5″ index cards. White, ruled front, and blank back. Pack of 100 4″ X 6″ index cards. White, blank front, and blank back. Pack of 100 4″ X 6″ index cards. Blue, ruled front, and blank back. Pack of 100 4″ X 6″ index cards. Canary, ruled front, and blank back. Pack of 100 4″ X 6″ index cards. Green, ruled front, and blank back. Pack of 100 4″ X 6″ index cards. Multi, ruled front, and blank back. Pack of 100 4″ X 6″ index cards. White, ruled front, and blank back. 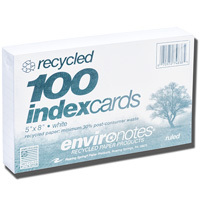 Pack of 100 ruled index cards. 4″ X 6″, white, made of recycled paper products. 3″ X 5″ index cards with front college ruled and blank backs. 100 per pack. Made of recycled paper. Perfect for flash cards! 5″ X 8″ index cards with front college ruled and blank backs. 100 per pack. Made of recycled paper. Perfect for flash cards! Pack of 100 3″ X 5″ index cards. White, blank on front and back.